Session 1 - Are You Living On AutoPilot? Session 3 - Do You Believe What You Think? Exploration of how mindfulness can be practiced in a holistic way involving the whole self - body, soul and spirit. Christian Mindfulness is available as a Six Session Online Course (session topics listed below). Each session is in the form of a video presentation including slides, visuals, biblical content, guided self-awareness and God awareness meditations, questions for reflection and a suggested weekly meditation programme. The Bronze, Silver or Gold Package options above offer the best value for money and give you 12 months instant access - to view the online course sessions via password login. To purchase the package of your choice click on the appropriate membership level above. Downloads of the online course are not available to purchase. Bulk access discount options are available here. For more information on Meditation Scripts click here. For Advanced Meditations click here. For Meditation MP3s click here. For Mindfulness Practice Review Calls click here. "I wanted to write and thank you for the wonderful course you have put together. 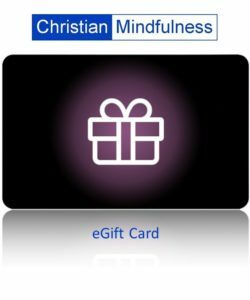 I first stumbled across mindfulness in searching for something to help me cope with anxiety, and as I wasn't completely sure about the foundations of secular mindfulness I was really interested to find a course that had Christianity as its heart. Whilst it hasn't 'cured' my anxiety, mindfulness has become a tool which really helps me calm my mind and find God in stillness - something I see as part of my life now rather than a temporary fix. I have really benefited from each of the teaching sessions and meditations, particularly the ones based on contemplative prayer."